The latest audio adventure for the Seventh Doctor, Ace and Mel take them to a normal estate. Like the previous McCoy release this year, it effortlessly manages to capture the tone of the Seventh Doctor’s era, most certainly that of Paradise Towers, with its high rise tower block setting. 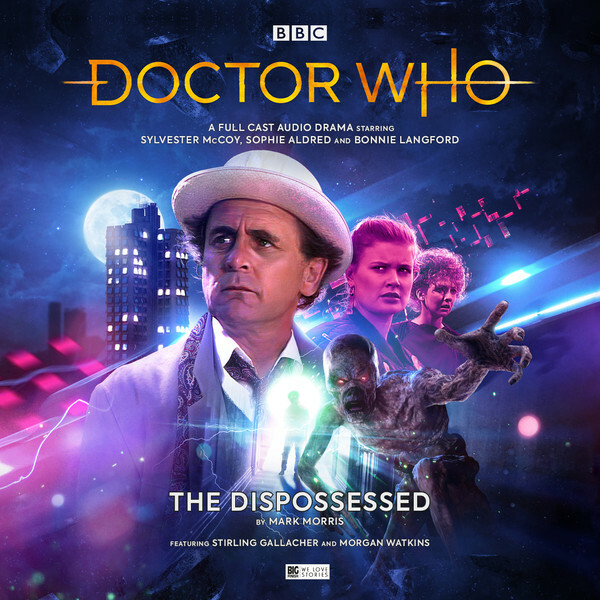 Fortunately for us listeners though, The Dispossessed is a far superior outing. The Doctor, Ace and Mel arrive on your normal council estate. If a normal estate is surrounded by eternal night. Zombies stalk the corridors, lifts go to other worlds, there is a strange woman and an even weirder robot. While the Doctor meets the only two tenants left, Mel and Ace find themselves in the company of Arkallax, a creature who knows more than he is letting on. The Dispossessed does have the feel of Paradise Towers, taking something ordinary such as a tower block or council estate and giving them something alien and evil about them. But where the differences between Paradise Towers and The Dispossessed end is that this one is a fairly light affair and moves along at a pleasing enough pace. And there is some good horror in here. The Dispossessed isn’t exactly scary but there are some good horror moments with the Doctor and his companions fighting zombies. The horror motif is certainly here. This comes as no surprise when one discovers that the writer is Mark Morris who normally writes some terrific Doctor Who horror stories. He seems to really enjoy horror and this isn’t the first time he has used zombies as a villain. Check out Plague of the Daleks for an even more gruesome example! It does come as a surprise to find that this story isn’t more horrific. It’s got some very creepy ideas and imagery but Morris throws in some nice sci-fi ideas to keep things from becoming an episode of Hammer House of Horror! What is also nice about The Dispossessed is that there is a nice mystery that lies at the story’s heart. You are kept completely in the dark for the first two opening episodes and during the third and fourth episodes threads you might have previously missed start to come into play and the whole plot becomes clear. Morris has also penned some nice guest characters too, Ruck and Jan, played brilliantly by Morgan Watkins and Anne Mitcham come across as quite a sweet character. Morris manages to put them into situations where you have to root for them, some of those situations are quite dire, Ruck gets put through the wringer an awful lot and we are left to marvel at how they have managed to survive, alone in this tower block for such a period of time. Morris also creates Isabel, played nicely by Stirling Gallagher, who is a fresh take on the somewhat dated sci-fi trope. She gets some brilliant lines and like Ruck and Jan, you root for her, especially with some of the one-liners she hands out! The main cast are on fine form too, Sylvester McCoy is having a ball all the way through this script and Bonnie Langford and Sophie Aldred continue to prove why they are such a good pairing. Jamie Anderson is back in the director’s seat and continues to prove why he is one of Big Finish’s fastest rising stars. He’s assembled a formidable cast who give it they’re all. He has done a fantastic job yet again. The Doctor, Ace and Mel are caught in a forever night. After crossing the threshold, a strange world awaits them. An army of tortured souls. A lift that leads to an alien landscape. An alien warlord left for dead, and willing to do anything to prolong his life… it’s all in a day’s work for the Doctor. But when his companions become victims of the desperate and powerful Arkallax, the Doctor will have to do battle in a psychic environment where he must make a choice. Save his companions… or himself. Sylvester McCoy (The Doctor), Sophie Aldred (Ace), Bonnie Langford (Mel), Morgan Watkins (Ruck), Anna Mitcham (Jan), Stirling Gallacher (Isobel), Nick Ellsworth (Arkallax). Other parts played by members of the cast.